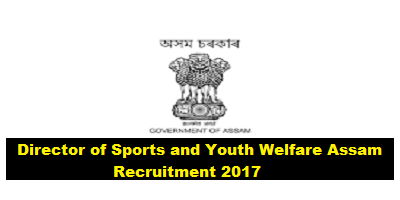 Director of Sports and Youth Welfare Assam recruitment 2017 latest recruitment notification is out for filling up various positions . According to the Director of Sports & Youth Welfare Assam Recruitment 2017 notification, Applications are invited from the Indian Nationals to attend an Walk-in-Interview for engagement of different posts in the office of the Directorate of Sports & Youth Welfare, Assam. All the posts are contractual in nature. Following are the details of Director of Sports and Youth Welfare Assam recruitment with number of vacancies, different posts details ,Age limit , Educational Qualification , Experience and Payband etc. Eligible and Interested candidates with requisite qualification may walk-in for the interview with Curriculum Vitae (CV) along with supporting documents in original (with 1 set of self-attested Photostat copies) and two passport size photographs, on 22nd October, 2017 for Category-A and 23rd October, 2017 for Category-B from 11.00 a.m. onwards to 5.00 P.M. at the following office.